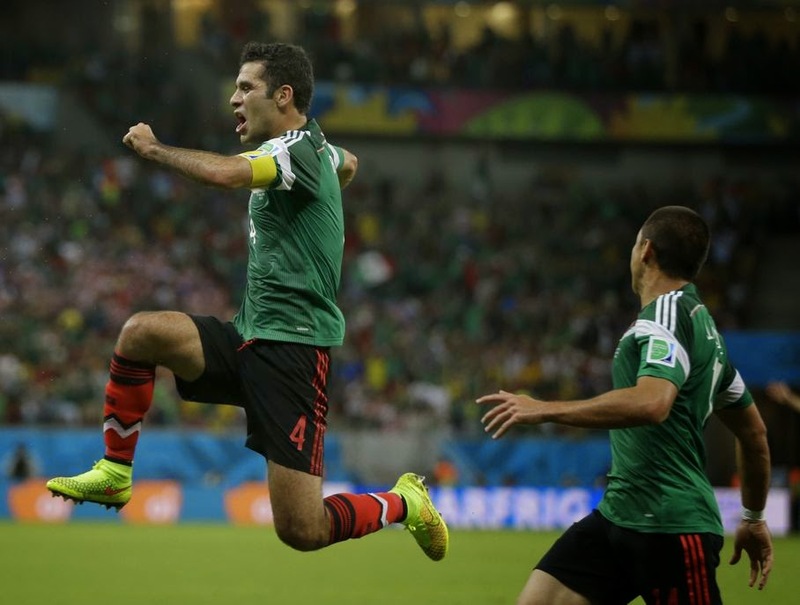 One of the first things Miguel Herrera did when he became Mexico's fourth coach in a year was call Rafael Marquez and ask the 35-year-old defender known as "the boss" to return to the national side as captain. On Monday, the world saw why. Marquez's pivotal goal from a header in the 72nd minute ignited a scoring burst, and Mexico surged into the World Cup's knockout stage for a sixth straight time with a 3-1 triumph over Croatia. "I did not hesitate one minute after my talk with him to appoint him captain," Herrera said of Marquez, now in his fourth World Cup. "He's had many achievements in his career, personally, but he's also provided leadership to the team, that soundness, and that is why they call him the boss." Marquez, Andres Guardado and Javier "Chicharito" Hernandez scored in a 10-minute span in the second half, dooming a talented Croatia side to elimination from the group stage. Mexico entered the game needing only a draw, but played aggressively and looked dangerous in attack even before breaking through. The result gave Mexico a second-place finish behind Brazil in Group A and set up a second-round meeting with Group B winner the Netherlands. "We overcame the first hurdle," Miguel Herrera said, adding that the team would dine with their families in Recife later Monday night. "We're going to celebrate tonight but tomorrow we have to start thinking of our match with the Netherlands." Marquez, who had scored in Germany in 2006 and South Africa four years ago, made it three straight World Cups with a goal by beating Croatia defender Vedran Corluka to head home Hector Herrera's corner. "They wanted him to retire, and look at him," Guardado said. "He plays like he's 23"
Three minutes later, Guardado found the net with a hard, left-footed, one-time shot after a cross from Oribe Peralta. Croatia didn't score until it was too late, with Perisic sliding a shot past Ochoa after being set up by a neat backheel pass from Ivan Rakitic. Croatia's late goal was the first Mexico has conceded in the World Cup, but "El Tri" hardly seemed to mind when the final whistle sounded and a lively, heavily Mexican crowd in Arena Pernambuco erupted. 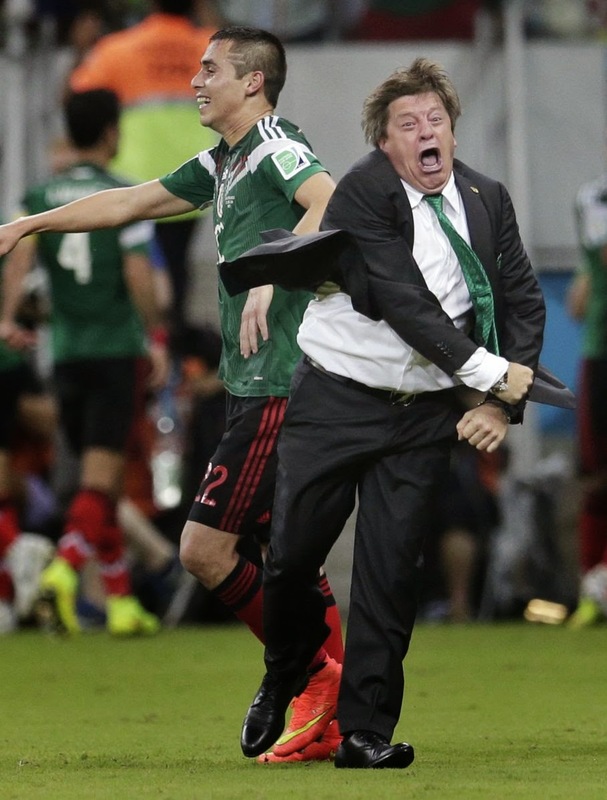 "Today we felt as if we were playing at home in Mexico," Miguel Herrera said. Mexico appeared to be laboring through a downspell before this World Cup. It struggled just to qualify out of CONCACAF and fired three coaches in a year's time before Miguel Herrera rescued Mexico's hopes. El Tri made it to Brazil as CONCACAF's fourth team after soundly beating New Zealand in a last-chance qualifier. Marquez was quick to credit his energetic coach for unifying the national team in a way he'd never seen before. "Officials, the coaches, the players have shown this unity and it is quite important," Marquez said. "We've shown this on the pitch and off, and that is why we have such a sound, robust group. We get along very well. ... We're all united. We're working together, and therefore you work comfortably, with joy." Known as a coach of the people for the way he engages fans on social media and at times in public, Herrera implored the Mexico faithful to "stay together" and sing the national anthem "like never before." Mexican fans, whose green jerseys distinguished them as the overwhelming majority in the crowd, belted out a thunderous rendition. Croatia players were heckled each time they took a corner kick, as was goalkeeper Stipe Pletikosa when he touched the ball. Mexico's counterattacks only further enlivened the crowd, particularly a sizzling 25-yard shot by Hector Herrera that rattled the crossbar in the 16th minute. Croatia: Stipe Pletikosa, Sime Vrsaljko (Mateo Kovacic, 58), Danijel Pranjic (Nikica Jelavic, 74), Ivan Perisic, Verdan Corluka, Dejan Lovren, Ivan Rakitic, Luka Modric, Darijo Srna, Mario Mandzukic, Ivica Olic (Ante Rebic, 69). Mexico: Guillermo Ochoa, Francisco Rodriguez, Rafael Marquez, Hector Moreno, Miguel Layun, Paul Aguilar, Jose Vazquez, Andres Guardado (Marco Fabian, 84), Hector Herrera, Giovani Dos Santos (Javier Hernandez, 62), Oribe Peralta (Carlos Pena, 79).